Where’s The Water?? Don’t Be Fooled! driving the back road that snakes away from Cochetopa Creek and my camp site at Dome Lake State Park. About nine miles after I cross Cochetopa Creek, I ford Pauline and Perfecto Creeks on Forest Service Road 794 then veer left on Forest Service Road 740-2A, a faint dirt track that dead ends at an old corral above Chavez Creek. From the top of the hill neither Perfecto nor Chavez Creek are visible in the grassy meadow below. If I didn’t know better, I’d think no way there is anything down there deep enough to float a trout. I am on my annual birthday week expedition in search of wild trout. Sadly, most of my pet streams near Salida and Gunnison are blown out, and the 4WD trails I navigate into some of my favorite backcountry creeks are washed out from the several weeks of monsoon rains. So I am heading south towards Del Norte in southern Colorado where the streams appear to be in better shape according to the Colorado Division of Water Resources water talk website. I’ve reserved a campsite right on the Rio Grande River just outside of Del Norte and will be in the lap of luxury with full hookups for my mobile fish camp. 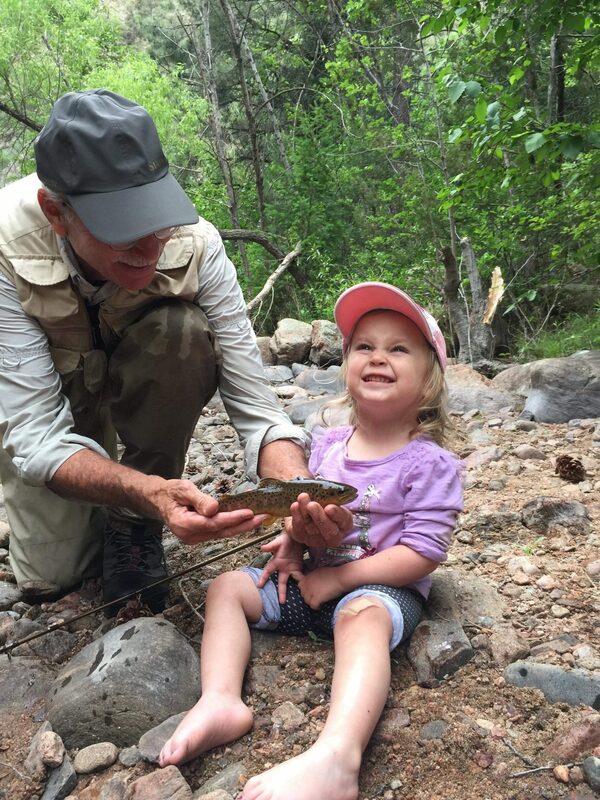 Pass Creek is a little gem with some big fish, overlooked by anglers whizzing by to more famous waters like the Rio Grande and the Piedra. And with the weatherman predicting an 80% chance of rain every afternoon this week, another draw is that it’s easy to reach on a good gravel US Forest Service road. I spend the waning hours of the day getting my gear ready, wondering if I can catch (and release) as many fish as my years on earth–something I’ve managed to do the past few birthdays but a feat that is becoming increasingly challenging as Father Time marches on.